Acrylic polymer liquid to producer (PMCC)polymer modified cementitious composite for waterproof coating,bonding agent,overlays and repairs mortars converting capacity for coating/slurry. Known for the trading, supplying and wholesaling a broad assortment of Safety and Construction Equipments, we 'Quality Trading Company' incorporated in the year 1997. Product ranges offered by us are consists of Plastic Tarpaulins, Safety Product and Welding Equipment. 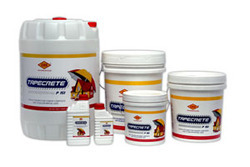 These products are precisely designed by taking optimum quality materials as per the set industry parameters. Offered ranges of the products are highly appreciated and demanded across the market owing to their perfect dimension, longer service life and high quality. Apart from this, to satisfy our clients in effective way, we are offering our products in various packaging. All the offered products are at most reasonable prices within the promised frame of time. We deals in various brand like Taparia Tools, Usha Martin, INDEF, ACME Safety Products and Karam. We are offering a quality approved array of safety and construction equipments to our prestigious customers. For this, we have created a huge vendor base across the market. These vendors are selected on the basis of their legal status, quality of the offered products and time to deliver the products. Also our vendors are fully aware with our clientele, so they are providing products accordingly. We have recruited a team of best and experienced professionals to carry out our business tasks. With the help of our highly skilled team members, we are offering to our customer’s best and effective products. Our procurement agents work with full dedication towards their allotted tasks and enabled us to deliver a precisely manufactured product range.